Our goal is to provide you with the highest level of service in our industry so that you are completely satisfied with your purchase from DraperyCurtainRods.ca. If for any reason you are not satisfied, simply return your purchase with your receipt for an exchange or refund within 30 days of purchase. A receipt and the item's original packaging are required for all returns and exchanges. Returns and exchanges are subject to a 20% restocking fee. - All returned products must be in new and unused condition (including all accessories, packaging, instructions etc.). - Damages on home delivered products must be reported within 48 hours of delivery. - If we do not have the item to replace, you can either choose another item or we can refund your money. 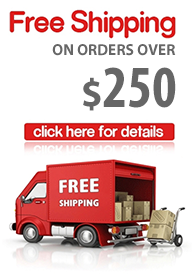 - Orders can be cancelled within 6 hours of order placement without a cancellation fee. After 6 hours and before delivery, a 20% cancellation fee will be charged. Shipping charges cannot be refunded once the items have been signed for. Your signature implies that the package was not only received but received in good condition. In case of hidden damage as well as incorrect products or quantities, you will have to make a claim. All claims must be within 48 hours from the time you sign for the package. We strongly advise you to inspect all items carefully when you receive your order. If there is any damage, please call our customer relations advisors Mon-Fri 10AM - 7PM Eastern Time at 1-800-680-2905 at your earliest convenience, but no later than 7 days after the package was delivered. Keep the original box, packaging materials, as well as any paperwork that came in the box. We suggest that you email us a digital photograph of the damaged box and/or items. A customer relations specialist will help you file a claim with one of our shipping service providers if needed. - Items that have been modified in anyway i/e: cut, stained, painted, drilled, scratched or screwed are not eligible for return. Once your items have been inspected we will then issue you a credit. - For refunds and exchanges, we may ask that you provide us with your name, address and telephone number for fraud prevention and audit purposes. - All delivery, shipping and handling charges (unless an error has occurred in the shipping of your order on our part) are non-refundable. Please note: No refund/credit will be given for shipping and handling charges, unless damaged, defective or is our error. Merchandise returned must adhere to our Return and Exchange Policy. Please allow a minimum of 14 days for your return to be processed. Draperycurtainrods.ca appreciates your business and will take all reasonable efforts within the guidelines of this policy to ensure you are satisfied with your purchase. If for whatever reason you are not happy with your purchase you have 30 days to ship the package back to us. Please contact us within 30 days from the date your package arrived at your door to receive a return number from us. When returning the package to us the order number and the return number have to be visible on the outside of the returning package. You also must send back the original packing list with the package, otherwise we will not be able to process your return. Also make sure to keep the invoice we included in your order as this may be required for some returns. Whenever possible please ship the return of multiple items in one box. DraperyCurtainRods.ca is not responsible for any lost or damaged parcels. The cost of return shipping to Drapery Curtain Rods is to be paid by the customer.